Contract for an amount exceeding 4000 zł provide you with free transportation throughout the country*. The offer applies to all orders, also for furniture in the promotion. The exercise of the free transport is a selection of pre-payment, as forms of payment for your order during its assembly. 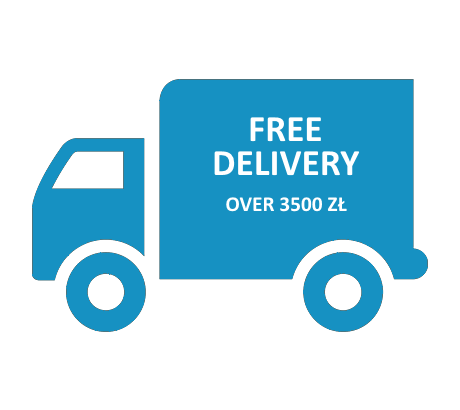 Free delivery is addressed solely to individual customers and applies to retail orders. The promotion does not include bringing furniture into the apartment. The obligation to provide the right amount of people needed to bring the goods lies with the customer. It can also buy additional service. After fulfilling with the terms of participation in the promotion of free shipping, shop, select the appropriate form of transport, and agreed with the buyer within deliver the goods for 0 zł. If you want to learn more about the free shipping, please contact our Customer Service at tel. +48 500 690 691. Information on the general conditions of carriage of goods purchased in the shop MeblujemyDOM.pl will also find here. * - Offer applies only shipping to addresses in the Republic of Poland. The promotion does not include transportation of furniture to the EU countries .